Rosie Aiello lived in the Middle East for nearly 25 years, during which she endured financial, emotional, verbal and psychological abuse from her husband. It took her about 18 years to realize the relationship was abusive, believing she wasn’t good enough as a wife or mother. About 8 years ago, after 7 years of planning, Rosie orchestrated an international escape back to the U.S. with her daughter. When Rosie returned, she landed in the midst of an economic depression in 2009 and even though she had been a high achiever and successful in corporate finance in Silicon Valley before marriage, she had been out of the market for over 25 years, putting her at a distinct disadvantage. Determined to make a new life for her and her daughter, she began attending workshops and learning what she was good at, where her skills lay. Starting over at 56 was no easy task, but eventually she decided that becoming an entrepreneur was the easier choice. Utilizing her background in corporate business, and her MBA, she became a productivity consultant and business coach. Despite the fact that they had gained freedom by returning to the U.S., they were dealing with PTSD, depression and anxiety. She had flashbacks, had to manage her daughter’s symptoms, deal with attorneys internationally, private investigators, and the fact that her husband was relentlessly difficult. Rosie taught herself how to use software, read and studied, to help her get back into the market. She earned recognition for her contributions to networking groups and coaches. She is a recipient of the eWomen Network International Business Matchmaker of the Year Award. She and her daughter started writing their memoir in January 2017. It offers a rare look at domestic violence, or what she calls family terrorism from the point of view of a wife, mother and child’s perspective. It’s entitled 11 Hours to Freedom. Rosie’s goal is to save 1,000,000 women and their children from domestic violence, raise $100M to help them get out, get started and learn how to create an extraordinary life. She’s determined to disrupt the cycle of abuse. 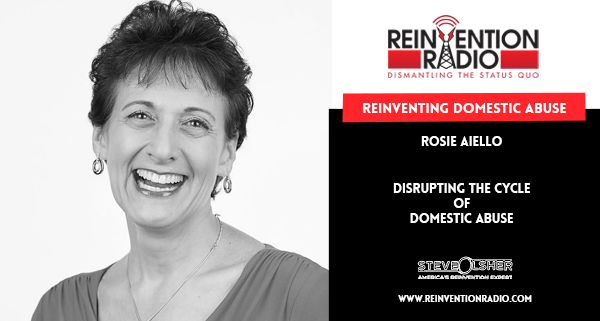 TUNE IN to hear the details of her international escape, why her ex-husband is still stalking her, and her best advice to women who are still suffering to move forward from domestic abuse..
1 – Rosie Aiello lived in the Middle East for 25 years. She reconnected with a man she met during her college years at Berkeley. They ended up getting married, lived in Saudi Arabia for 12 years, had a daughter together, and then went on to live in Lebanon. 2 – From the start of the marriage there were indications of abuse. She ultimately landed in a state of fight, flight, or freeze. The more she reacted and responded to stand up for herself, the worse it got. Rosie lived in silence for 18 years of a 25 year marriage, hiding the abuse from everyone. After years of constantly being discredited and mentally abused (and physically, on occasion), she began to believe that she wasn’t worthy — this was the way it would be. 3 – So why did she stay? Mainly it was because in the Middle East the father automatically got custody of the children from the ages of 7-21. It wasn’t until one day her daughter said to her, “Get me away from my abusive father” that she started to plan their international escape. She broke down and shared with her brother what had been going on for so many years. 4 – Rosie didn’t have a plan for after the escape. She ended up started a consulting business and then began to share her story with others. Sharing the story has now led to writing a memoir with her daughter, 11 Hours To Freedom. Together they are on a mission to help other women and children. Reinventing Stranger Danger – In this episode, Altovise Pelzer chats with Steve, Mary and Richard about why she did not pursue jail time for the young man who molested her daughters. And, what happened when someone gave her a first class ticket for a flight that changed her world.